As one of the most serious lifestyle diseases today, diabetes is the focus of attention of many health practitioners and patients alike. The good news is that it only takes steps as simple as 1-2-3 in order to manage the disease. This is what we learned at the recent 1-2-3 Challenge event that we attended recently. This useful application comes from Glucerna, a brand name from top pharmaceutical company Abbot Laboratories. This brand is known for its product line of foods and beverages that are specifically formulated for patients suffering from diabetes. Through these products, the glucose concentration in the bloodstream is effectively controlled without depriving the patient from his much needed calories. The 1-2-3 Challenge app supports these products with practical tools and tips to help patients manage their disease. Diabetes is a condition that involves the inability of the body to process the sugars a person consumes. Having high blood sugar levels in the body can cause symptoms like frequent urination, increased hunger, and feeling thirsty all the time. Left untreated, this could result in serious complications such as heart ailments and renal problems among others. Results of medical studies show that diabetic patients are in fact two to four times more predisposed to suffering from a heart attack or a stroke. While it is also a fact that proper diabetes management is challenging for a lot of patients, Dr. Jose Rodolfo Dimaano Jr., medical director of Abbott Nutrition Philippines, believes that simple steps like maintaining a healthy and active lifestyle are essential to keep the disease under control. And this is exactly what the 1-2-3 Challenge helps patients with. When it comes to diabetes management, the biggest hurdles faced by patients are excess weight and inactivity. It’s no secret that many people find it difficult to lose weight and live an active lifestyle. Nutrition and health experts believe that eating and exercising right can help people with diabetes manage their disease. 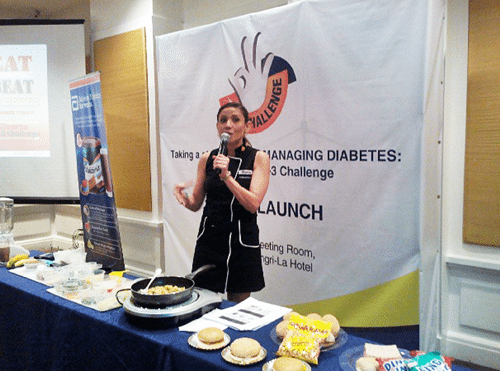 US certified fitness nutritionist, chef, and weight management expert Nadine Tengco talked about how “little steps such as eating right, exercising, and incorporating specialized nutrition such as Glucerna Triple Care as part of your diabetes management plan” can help patients shift to a healthier lifestyle. Sports and Fitness Science Specialist Coach Jim Saret supported this by talking about how easy it is to exercise in 4 minutes using the Metafit bodyweight training system. 1. Healthy Eating – easy to prepare recipes are made available through the mobile app, with meal plans that help patients ensure that they eat the right kinds of foods in the right amounts. 2. Proper Exercise – daily exercise plans are included in the program. There are also step-by-step instructional videos to show patients exactly how to do the exercises correctly. 3. Specialized Nutrition – fitting Glucerna’s products into the patient’s daily nutritional intake is easy with suggestions provided in the 1-2-3 Challenge app. Online tools to track and monitor progress throughout the program are also available.